I’m delighted to find that Rose George’s new book Deep Sea and Foreign Going: Inside Shipping, the Invisible Industry that Brings You 90% of Everything, is Book of the Week on Radio 4. Good for Maersk for allowing her to join the voyage. I’m looking forward to reading the whole book. Regular readers of this blog will know of my mild obsession with shipping containers. 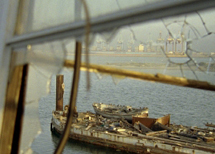 Thanks to @illicit_econ on Twitter (well worth a follow) I’ve also found this documentary film essay, The Forgotten Space, by Allan Sekula and Noel Burch. I’m not sure how to get hold of this in a UK format but it looks enticing.